To celebrate the release of Perchance to Dream, I’m interviewing some of the authors featured in the anthology. Our last interview is with Allan Davis. 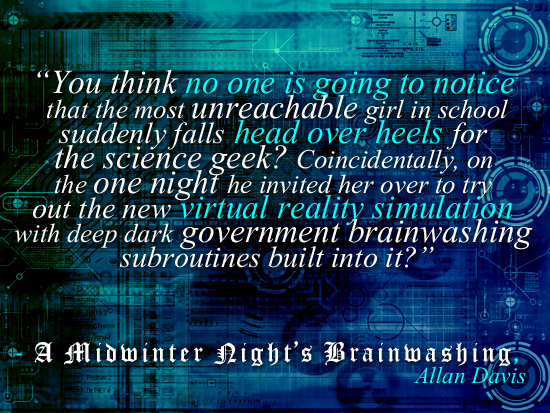 “A Midwinter Night’s Brainwashing” is one part Shakespeare, one part Inception, two parts the Matrix… and four parts Groundhog Day. It’s all built around what Puck did in the original, and how a similar series of mistakes, misunderstandings, and technical mishaps could happen in a science fiction virtual reality world. What drew you to A Midsummer Night’s Dream for this project? You mentioned to me before that you’ve written other Shakespeare-inspired stories—I was even lucky enough to read one several months ago. What is it about Shakespeare that inspires you? Shakespeare wrote for everyone. He didn’t write material that only a highborn noble would comprehend; he made sure that the drama and the humor would be there for everyone. If he were alive today, he’d be writing cable drama series during the week, network sitcoms on weekends and huge Hollywood blockbusters on holidays, with four of every award on his mantle—Hugo, Oscar, Golden Globe, Razzy, they’d all be there. Shakespeare’s themes, plots, and especially quotes, are everywhere. Are any of your other Shakespeare-inspired stories available online or in other anthologies? Well, “Shakespeare…With Zombies” is the one you mentioned above, and can be found on Shards and Phractures. And I tweaked a Shakespeare quote into the title of my own anthology, Perchance to Scream. Have you written any other young adult books or short stories, or do you plan to? I hope you enjoyed this interview with Allan Davis! You can read his story, “A Midwinter Night’s Brainwashing,” in Perchance to Dream, which is available now on Amazon, Barnes & Noble, and other major retailers. If you’d like to learn more about Allan, you can visit his website, or connect with him on Twitter at @AllanDavisJr.